Panasonic RP-HTX7 review | What Hi-Fi? These were a huge surprise. It's not that Panasonic doesn't really do headphones – on the contrary, it has a substantial line-up – but we've never heard a truly good pair until these arrived in our test rooms. 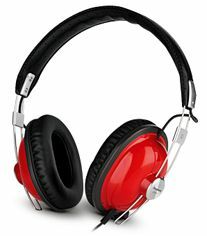 Pop on these retro-looking cans (there are six colours to choose from) and the leather-effect earcups create a seal around your ears that naturally blocks a decent amount of outside noise, while the overall fit is a perfect blend of firmness and comfort. At 1.2m, the standard cable is the perfect length for portable listening (they're closed-back, too - so won't leak sound on your commute), but you also get a 2m extension cable and a 6.3mm adapter for home use. The secret to the RP-HTX7's sonic success is balance. Vocals are lovely and clear, bass is weighy but resists getting over-bearing, and treble is distinct without ever sounding harsh. In fact, nothing sticks out more than it should. Detail levels are impressive for the money, so you get all the introspections and delicacy of acoustic numbers such as Bon Iver's Holocene, but they're also capable of the kind of punch and control to keep Mastodon's latest metal masterpiece both exciting and listenable. It isn't easy to get affordable on-ear headphones right - we've heard enough rubbish pairs to be very confident of that - but with the RP-HTX7s, Panasonic has managed it in serious style.